When you're in the battle your main goal is to kill the enemy boss. You can do with your own hands, or let your minions do the dirty job. Below are some details on the actions you can take in order to affect the battle outcome. 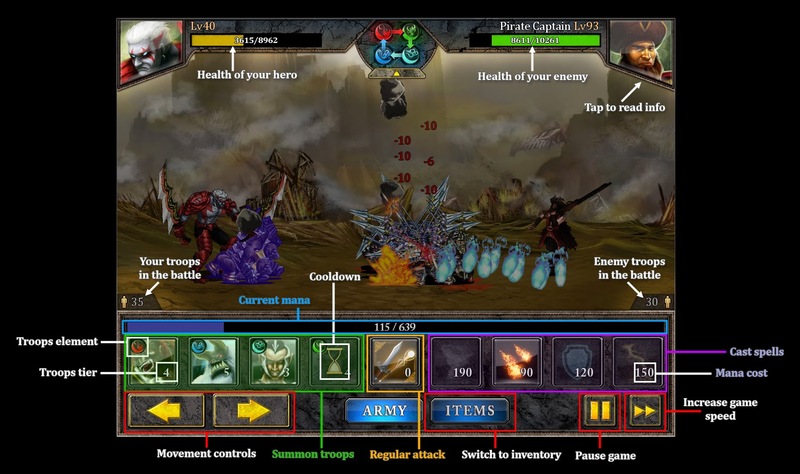 To attack with our basic attack tap the button indicated on the image above as "Regular attack". Make sure to cover as many enemy troops as you can so your Multi-Hit won't go wasted. Each time you attack using your basic attack there is an 8-second cool-down time period before you can attack again. More on bosses and their stats in Heroes, bosses, items and stats. When deciding to summon troops watch the enemy troops and try to summon troops that can counter enemy ones (more on countering in Troops and Elements). Each time you summon troops a global troops cool-down is activated and lasts for 3 seconds. Each time you summon troops of a certain kind there is a local cool-down for that specific kind of troops which prevents you from summoning the same troops type for 6 seconds. Try summoning troops as soon as the cool-down runs out. You need mana to cast spells, and the spells for which you don't have sufficient mana will be disabled till you regenerate enough mana or refill it with a potion. Each spell has its own cool-down time. You can find spell cool-down time in the spell information. When casting spells try to use the ones that counter specific units of the specific element if there are such troops in the battlefield. More on spells in Magic Spells. If your health or mana is low you can always use some consumables from your inventory. To reach your inventory tap Items button and then pick the potion you'd like to use.